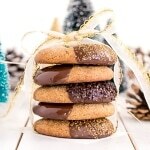 These Chocolate Dipped Ginger Cookies are the perfect treat for the holiday season! Chewy ginger spiced cookies dipped in dark chocolate. 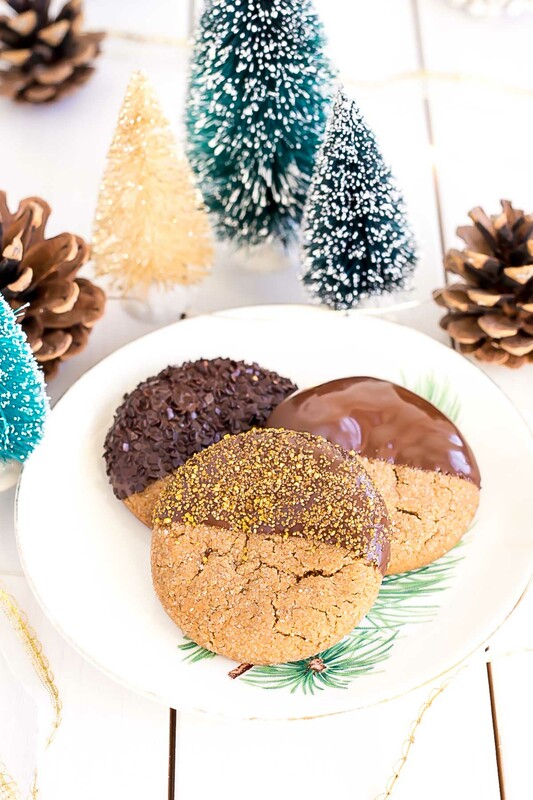 I know I don’t usually have a post coming your way mid-week, but I wanted to get these festive Chocolate Dipped Ginger Cookies to you asap in case you’re looking for an easy and delicious recipe for your cookie exchanges, or just holiday baking in general! The inspiration for these cookies actually came from the Chocolate Gingerbread Cake I made a couple weeks ago. It reminded me so much of these traditional Polish cookies my parents always buy during the holiday season. They’re puffy and soft gingerbread cookies coated entirely in chocolate. I actually find them dry, and I don’t know if they’re supposed to be that way or if it’s because they’re old (lol). My version is not at all dry. 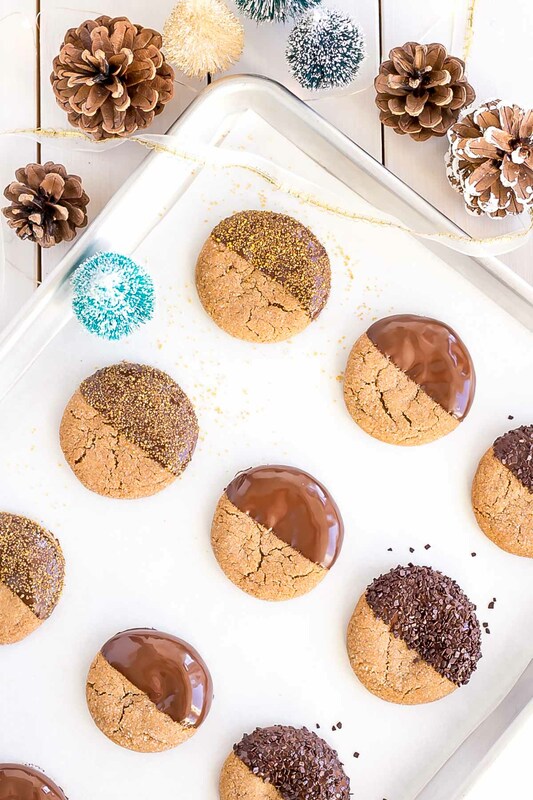 These Chocolate Dipped Ginger Cookies are perfectly chewy and only half dipped in chocolate, so you can have the best of both worlds. So as much as I hated my pics last week, I LOVE these ones. The weather really does make a huge difference. We had our first day of sunshine the other day after weeks of gloom and rain. It’s actually been nice and sunny all week (albeit freezing). We finally, FINALLY have all our Christmas stuff up too, and ugh, that was an ordeal. We’ve been wanting to get a new Christmas tree for a few years now. Well, more like needing to. We love the one we have — it’s so pretty and unique, and a bit rustic. But we got it 10 years ago, and the lights on the whole bottom 2/3rds of the tree have burnt out. We’ve been using additional light strands to compensate, but it’s a bit of a pain. After what seemed like endless searching, we finally found a tree that we deemed “good enough”. We couldn’t find anything remotely close to the one we currently have and have no way of telling the brand of it. All I remember is that we got it at Zellers (which doesn’t exist anymore) and it was designed by some clothing designer (but I can’t remember who). Anyhow, we finally buy a new tree, and of course it won’t fit in the car, so we have to take it out of the box and break down the box and lug it all home. 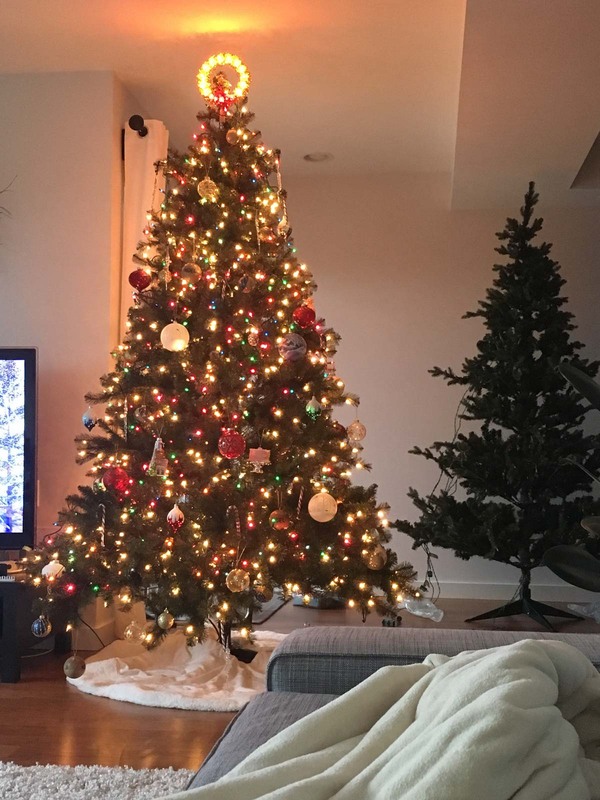 We set the tree up (which took a good 2 hours) and we realize that it is HUGE and blah and neither of us likes it much. Ugh. We actually ended up quickly putting together our old tree to compare. 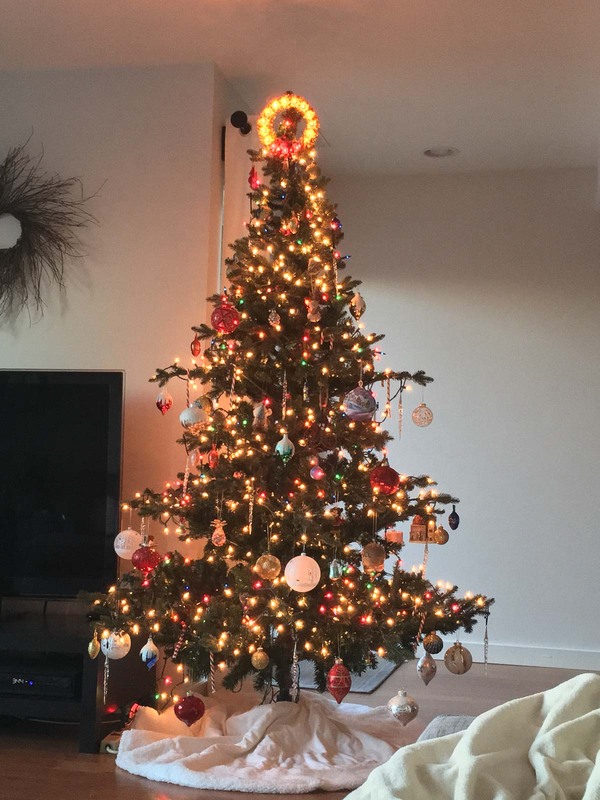 I loved the lights on this tree (we added extra strands of colored lights), but I just hated the shape. All of the ornaments seemed buried in there. Nothing stood out and it just seemed… messy? I don’t know. The old one just has more character and seems more realistic to me — it reminds me of the real trees we had growing up. Maybe we should just get real trees from now on. I kid you not that I took this entire tree down on Monday and set the old one back up. We returned the new one last night. Thankfully they took it back without issue, but holy CRAP what a colossal waste of time that whole thing was. And maybe I’m just crazy (likely), but I couldn’t stomach getting rid of our old tree. Too many fond memories and it’s SO pretty. I had to buy two extra strands of white lights to compensate for the broken ones, but oh well. I still like it better. 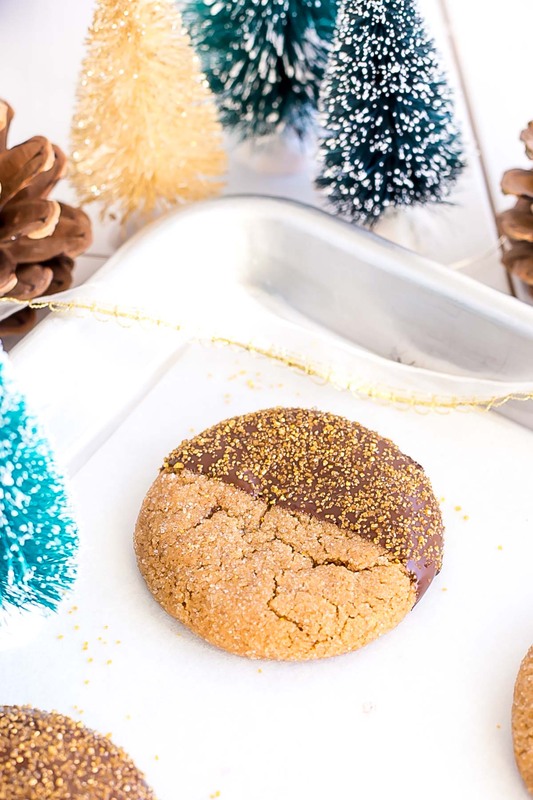 I’m currently sitting here, basking in its lovely glow and eating two (or three) of these Chocolate Dipped Ginger Cookies. If you think chocolate and gingerbread is a bit of a weird combo, I don’t totally blame you. I probably wouldn’t gravitate towards it had I not grown up with these cookies. Honestly though, the flavours go really well together! I chose to dip the cookies into dark chocolate, but you can use any kind of chocolate you like. I prefer to use high quality chocolate because you can really tell the difference in flavour — especially with something like these cookies — but if all you have is good old chocolate chips, those will work just fine too. 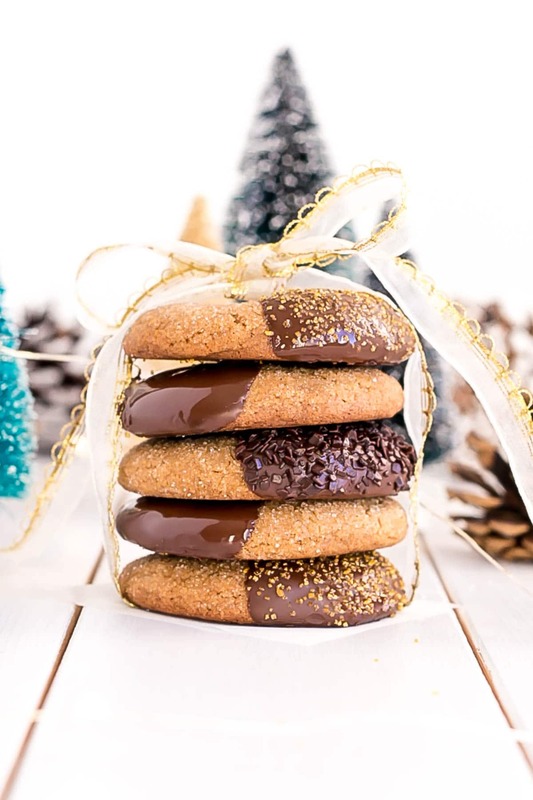 These Chocolate Dipped Ginger Cookies are perfect for your holiday cookie exchanges, as gifts for holiday party hosts, or sweet treats to snack on throughout the season. I usually chill my cookie dough before baking, but it was not necessary with these cookies, and actually the non-chilled ones baked up much better. Ideally, use good quality (couverture) chocolate if you can find it. 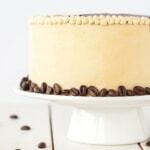 I use Callebaut, but Guittard or Valrhona are excellent options too. Ghirardelli and Lindt will do in a pinch. If you don’t have any of those, chocolate chips will work fine too! Do not use Bakers chocolate. Adding a bit of shortening to the chocolate is not necessary, but it helps prevent fat bloom. The longer your melted chocolate sits, the greater the chance of this happening. It’s less likely to happen with higher quality chocolate. I used gold sanding sugar and chocolate flakes to decorate some of the cookies. For an extra kick, you can add 1/4 cup chopped candied ginger into the cookie dough at the end, or sprinkle it on top of the chocolate. Preheat oven to 375F and line baking sheets with parchment or silicone mats. Whisk flour, baking soda, cinnamon, ginger, cloves, and salt in a medium bowl. Using a stand mixer, beat butter and sugars till pale and fluffy. Add molasses and egg and beat until combined. Portion dough using a medium cookie scoop (1 1/2 Tbsp). Roll into a ball and dip tops into granulated sugar. Place on baking sheet at least 3" apart (I did 6 cookies per sheet) and bake for 10-12 minutes or until cracks form. Cool on cookie sheet for 10 mins then transfer to wire rack to cool completely. 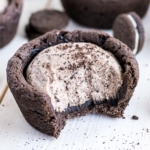 Once cooled, dip cookies in melted chocolate and place on parchment lined baking sheet. When partially set, sprinkle with gold sanding sugar or chocolate flakes if desired. 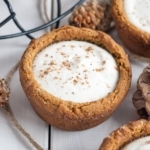 These were a huge hit with my family and friends! They will be part of my holiday cookie baking forever. Delish! 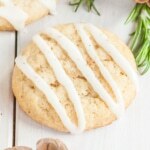 These cookies were very easy to make, the presentation spectacular, and the flavour – wow, so delicious! 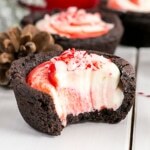 I am making these today. I don’t have sanding sugar or chocolate flakes so mine are not going to look as pretty. BUT I have to try the ginger chocolate combo so I am going for it. xo. Omg so exciting! I am SURE yours will look just as pretty — I actually like the plain chocolate ones the best, looks wise — nice and simple! Let me know what you think of the combo! By chance is there supposed to be baking powder instead of or in addition to the baking soda? I made this recipe and they came out completely flat as pancakes both when I baked straight and after chilling for a few hours. Any thoughts where I went wrong? The flavor was excellent; absolutely LOVED the spice combination! Hi Alli! Hmm, no it’s just baking soda in these — could your measurement for the flour or butter have been off at all? They should not bake up super flat! I’m pretty sure I undermeasured my flour. I’ve weigh out my flour typically, but realize there is quite a variance depending on what brand of flour and I’ve also notice different weights for “i cup of flour.” Do you use 4.25 oz. as a 1 cup measurement? Thank you! Hi Alli! I actually don’t weigh my flour due to laziness (I know, I know!). I do fluff it up before I scoop it though so it’s not too packed. But yes, 1 cup would be 4.25oz. The cookie flavor is glorious, but I’m also struggling to get my cookies to be thick like yours. They’re not too flat, but they’re half the height of yours. Maybe they’d do better chilled so they don’t spread? I followed your recipe to the letter and have made it twice now with the same flat results. 🙁 I left the dough in a ball (didn’t flatten). All my ingredients are fresh and my butter and egg were at room temp with no shortcuts. I’m also in Oregon, so maybe it’s the damp? Hi Rachel! Chilling the dough would help for sure. Also, I wonder if your oven runs a bit hot — do you have an oven thermometer you can test it with? I definitely don’t think there’s anything weird about the combo of the flavors and loving the choco flakes and gold sanding dust. Gorge! Hi Olivia, your cookies are beautiful! Question about the step 5. After dipping the top of the ball into sugar, did you flatten it before baking? 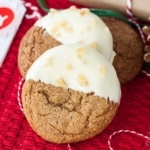 Or will the cookie ball spread when it bakes? Those cookies look delicious! The photography is gorgeous.